The return of Nazi-era seized art has broader consequences than you might think. On April 27, 2013, The New York Times described in detail the multi-generational account of the Rosenberg family and their single-minded quest to recover Nazi-looted artwork stolen from them during World War II. Anticipating the onset of war, Mr. Rosenberg presciently shipped a cache of art to New York and, merely days ahead of the German march into Paris in 1940, fled to re-establish his business on Manhattan’s Upper East Side. However, most of his collection was left behind and was lost to the Nazis and the chaos of war. Since then, the family’s fight to re-claim these stolen treasures has been dogged. The New York Times story was prompted by the family’s current dispute with the Henie Onstas Arts Center in Norway, a museum started by 3 time Olympic skating champion, Sonja Henie. 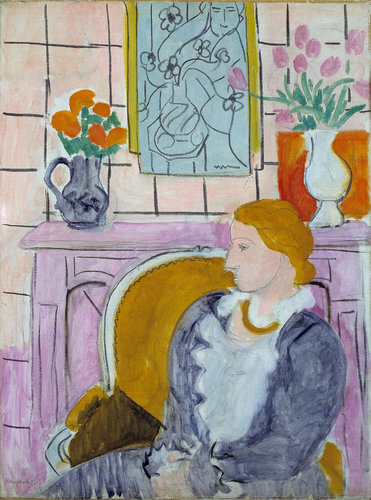 The fight is over Matisse’s “Woman In Blue in Front of Fireplace,” which was a centerpiece of the museum’s collection. Holocaust recovery art stories are quite compelling. Don’t we all want to cheer for the Paul Rosenbergs of the world? After all, the Nazis were bad guys. But…what happens when the bad guys turn out to be us? The tone set by those families who suffered from clear Nazi-era injustice, has since been picked up by countries who claim that items of antiquity and cultural significance were similarly stolen from them by western/colonial powers. That would be … us? The same day that the Cohen/Mashberg New York Times story ran, The London Times had a fascinating story about the return to China of 2 marble zodiac head busts which were among 12 stolen by British and French forces during the second Chinese Opium War (1856-1860) from the fountain at Haiyantang at the Royal Summer Palace. The fact that these zodiac heads remained missing for over 150 years has been a continuing affront to Chinese national pride. The 2 pieces had been offered at auction in 2009 as part of the sale of the collection of the late Yves St. Laurent, the famed clothing designer. The sale of the zodiac heads was not completed at the time and they were returned to the late designer’s estate. Last week, the Pinault family announced that it would donate the objects to the People of China with the aid of Christie’s, which helped to facilitate the process. Is there a real difference between holocaust art recovery and looted antiquities? Some items of antiquity have been openly traded in the art market for over a hundred years. Collectors have paid substantial sums for these items. These trades occurred when attitudes towards the original title and ownership were not so developed, that is, before compelling holocaust recovery stories changed current moral views on the matter. Should innocent antiquity collectors now be forced to disgorge their family treasures without compensation?